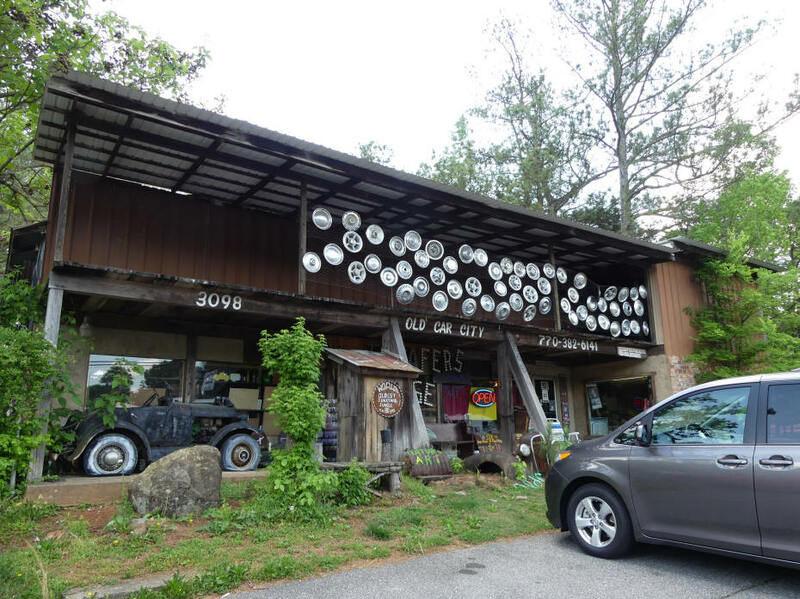 A road trip down Georgia’s I-75 from Tennessee to Florida offers lots of fun stops along the way. Navigating I-75 through Georgia can be a nightmare. Or it can be fun. The difference is in finding good food and interesting attractions with convenient stops en-route. Tunnel Hill is a great first stop. Remember the movie, “The Great Locomotive Chase?” This is where it started. You can tour the tunnel in a limo golf cart then stretch your legs walking around the Clisby-Austin House where General Sherman stayed and General Hood left his leg behind. There’s a tombstone for the amputated leg. Dalton, five miles farther, was once the chenille bedspread capital of the world, which is why you see peacocks art all over. Another movie, “Thunder Road,” comes to mind when you tour Dalton Distillery. Raymond and his son Chuck produce the world’s only moonshine made with sunflower seeds. You gotta taste it to believe it. Across the street the 1911 depot is rail-fan heaven as well as a Visitors Center with a live feed showing trains approaching plus train and Civil War memorabilia. A 1949 Southern "Crescent City" Pullman car sits in front. Cyra’s owners, TJ Kaikobad and wife Danielle, named their restaurant after their daughter, Cyra, meaning sun. Food is locally sourced so the menu changes often. It’s so environmentally friendly you’ll see live herbs growing in pots mounted on the brick wall inside. This is part of cooperation between Cyra’s and the local high school agricultural program. Great wine list also. Resaca is a history hotspot. 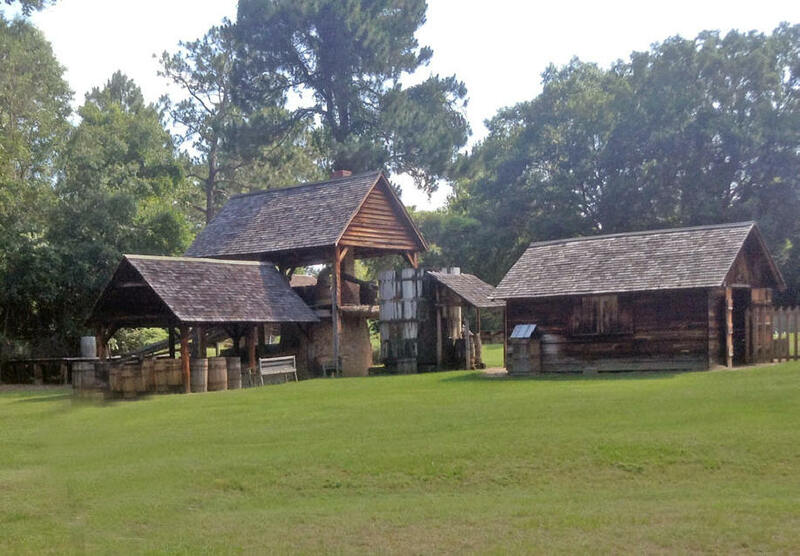 Resaca Battlefield Historic Site is a 483-acre park on the site of the first major battle of the Atlanta Campaign. There are four-miles of hiking trails. There are picnic tables, shelter, and restrooms; it's pet-friendly and right off the interstate but only open weekends. Just five-miles on the opposite side of I-75 is where you find some real down-to-earth food. Bowman’s Restaurant makes everything by hand. Most of the food comes from their farm. You can’t go wrong with the turkey, dressing, and sweet potato lunch. Save room for dessert. Lots of choices. All delicious. One stop you don’t want to miss is just off I-75 three miles south of Resaca. It’s New Echota State Park, a site remembering an event many Americans forgot, The Trail of Tears. Before it ended, 4,000 Cherokee died. An entire nation was dispersed. The park recreates the Cherokee capital. A museum and 12 original and reconstructed buildings bring the old capital to life. Missionary Samuel Worcester's home is the only one original to the site. Other buildings include the Council House, Court House, Phoenix Newspaper building, and Chief Vann’s Tavern. Open Wednesday through Saturday. Some days there are docents reenacting living history. You can take a break from the interstate and keep on hwy 225/3 back under I-75 and into Calhoun. In four miles you’ll come to Dub’s High on the Hog. They claim their barbecue is so good they don’t need a sign. Your nose will lead you there. Don’t debate that until you have tasted their ribs. The ROCK Garden is the place to walk off all that food. Three miles down hwy 53, it’s a unique combination of folk art and flowers. There are more than 50 miniature rock buildings set among flower beds created by an unusual garden "architect" named "Old Dog” assisted by his wife, “Lady Joyce.” Tiny rock creations of places like Paris and Notre Dame Cathedral line the paths to the creek. Backtrack to I-75 and head to Adairsville and one of the most unique resorts anywhere, Barnsley Gardens and Resort. The beautiful heritage garden has roses dating back to antebellum days. You have a choice of several restaurants or arrange a catered meal in the ruins of a pre civil war castle. You can ride horseback, hike, relax at the spa, or visit farm animals. Plus an all time classic history/ghost story with lost love; Confederate Soldier; Indian shaman; and greed that relives Cain and Able’s story. Look for the bloodstain that can’t be washed away in what was the mansion’s kitchen, now the museum. Dining here offers choices. Rice House, a 140 year old farmhouse, for upscale dining. It’s open Friday and Saturday dinners only. The other end of the spectrum is Beer Garden, an outdoor venue where you can enjoy bratwurst and craft beer. It’s open Friday through Sunday, noon to 10pm. The Woodlands Grill, resembling an upper-crust English hunting lodge, is open breakfast through dinner and offers a full bar. Food ranges from southern comfort to steak. Wherever you dine in Barnsley Resort, the food is prepared under the supervision of Executive Chef Joseph Elliot who cooked at a G20 summits for foreign delegates. Back to I-75 and head for White and Old Car City. This one’s for the guys. They’ll be in heaven in this classic cars’ graveyard. Older car fanatics will remember many of the relics. Younger visitors will recall seeing these “treasures” in the car-related movies that have been filmed here. The attic is filled with unique Styrofoam art. Directly across the street, Wes-Man’s Restaurant is a no frills café with indoor or patio dining. Stay on hwy 411 back to Cartersville which is filled with museums. Tellus Museum, displays dinosaurs to space shuttles. Their electric car exhibit proves they’re not a recent invention. Rock hounds drool over the Mineral Gallery. Youngsters want to play in My Backyard. You can dine at the cafe onsite. Booth Western Art Museum, another Smithsonian Affiliation, has western paintings and sculptures, lots of western artifacts, and Camelot and President’s galleries. Sagebrush Ranch is an interactive gallery for children. 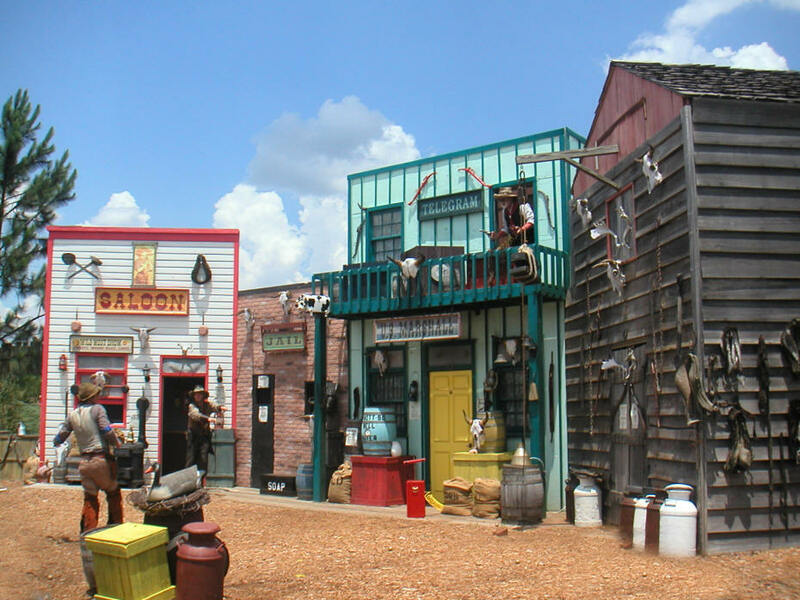 Duck out the side door to Bartow History Museum and learn the county’s history with interesting exhibits like the antique dentist office and beauty parlor. Although there is lots of parking downtown, you can leave the vehicle parked in Booth’s easily accessible lot and walk the two blocks to Table 20. That gives you a glimpse of the town square, old depot, and restored Grand Theater. Table 20 is a chef owned restaurant and Chef Chris Lyons can hold his own with the best of them. His entrees run the gamut from Angus Cheeseburger to Scottish Salmon. Everything has his special touch of interesting fruit and vegetables. 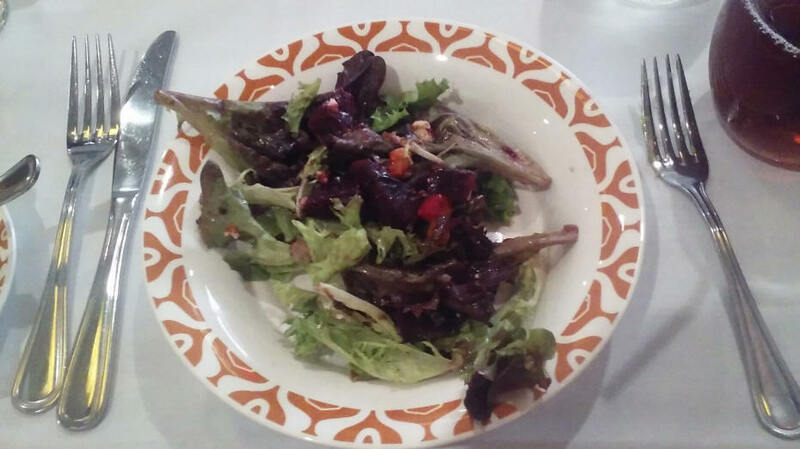 The salads, especially the Beet Salad with arugula, apple, goat cheese, and candied walnuts dressed with apple cider vinaigrette, are special. Roswell is gaining a reputation as a foodie destination. You have a lot of choices on Canton Street; with over 200 independent restaurants. If you are in the mood for Southern Food try Table & Main or Osteria Mattone, if you’re feeling Italian. Another reason to stop is Roswell’s history. There’s a trio of fantastic house museums. Barrington Hall’s story begins with Roswell King, a surveyor who saw Vickery Creek and believed it would be the perfect spot for his mill. He and his son Barrington founded Roswell. It was Barrington who built his Greek Revival mansion in 1842. No ropes here so you wander as if in a friend’s home. Roswell King invited some friends to his new town; one, James Stephens Bulloch, built Bulloch Hall in 1839 and Archibald Smith built 300-acre Smith Plantation in 1845. Besides these three homes Old Mill Park with remnants of Roswell King’s original mill tell Roswell’s story. Go straight through Atlanta on 75, it’s quicker and less congested than taking the bypass. Just off I-75 in Tifton, Georgia Museum of Agriculture offers a look at 19th century Georgia rural life. It’s filled with farm machinery from a peanut picker to an old hand plow, and showcases creating turpentine and ginning cotton. Part of the fun is strolling around a 19th century town with 35 structures relocated from around Georgia. If you visit on Saturday or special events, you can ride the state’s only working Vulcan Iron Works 1917 Steam Locomotive. The perfect spot for a quick lunch is the museum’s Drug Store. The root beer floats recall those good-old-days. Short order food like burgers and hot dogs are your choices. Their peach ice cream is excellent. A long-time Tifton resident recommends three locally-owned restaurants; 41 and Main, which has a wood-fired oven, or The Local, both on Love Avenue (Highway 41) and Charles Seafood on 7th Street. Valdosta is a treat for kids of all ages with Wild Adventures, theme park, zoo, and waterpark combined. Ride the Boomerang, feed a giraffe, or get wet at Splash Island. There are lots of “keeper” talks daily and concerts or shows often. There’s too much to see here in one day so the park offers second day admission free. They offer dining choices besides the usual fast food. Dockside Restaurant, Lonestar BBQ, Mama's Pizzeria, Safari Burgers all offer eat-in dining and items like sandwiches, salads and desserts. Valdosta is becoming a foodie destination with over 35 independently owned restaurants making it a good stop-over if you want to take a break from the road so if you’re looking for something besides theme park food, head into Valdosta and try Book and Table owner is Mike Orenduff and his wife, Lai. Mike is an author and publisher so you will have lots to read here. This is a quiet zone so turn phone on vibrate. The Egg and I is another choice for a lunch or breakfast stop. It is a chain but I can vouch for the Spinach Bacon Mushroom Omelet and service is excellent. A great new food tour, Miss Kate’s Tours, is focusing not only on food for the body but a bit of history, architecture, and culture in the mix. There are day and evening three-hour tours Fridays and Saturdays of the best restaurants in downtown Valdosta. It’s an easy 1/2-mile walk, wheel chair accessible and great for seniors but fun for all ages. You can have fun in Georgia even on the interstate if you know where to pull off.